1) Saturday, our church had an Easter party for all of the kids. It consisted of Pizza, Easter Baskets for the kids, Inflatables and an Egg Hunt. It was so much fun! Raylan had a blast, especially on the inflatables. 2) We colored Eggs at my dad's house and had a delicious Turkey Dinner on Saturday before the church Easter Party. 3) Easter Sunday was so wonderful. We are so very blessed to have a savior who loved us enough to die on the cross and rise again so that we could have eternal life in a heavenly home. Sunday was extra special because Justin went to church with Raylan and I. Let's all pray that he continues to go with us. 4) Sunday evening consisted of two egg hunts. One at my dad's house and one at Justin's parents house. It also consisted of yummy food too. The diet has definitely been blown this week lol. 5) I snagged me two pairs of cute Bermuda shorts for Spring at Goodwill this week. I also thrifted me an adorable purse. Who else loves thrift stores? This week's featured blogger is Whitney from Polka-Dotty Place. 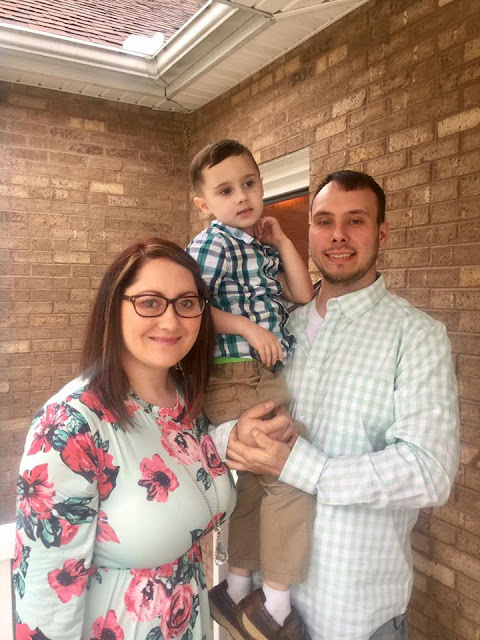 Whitney is a Christian, Wife, Mom and Teacher. She shares recipes, DIY projects, toddler activities, parenting tips, decorating ideas, organizing ideas and so much more on her blog. You will love her blog! Please stop by and say hello to Whitney!